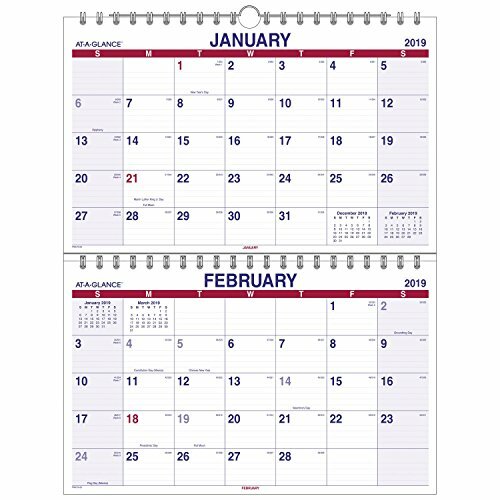 The AT-A-GLANCE Move-a-Page two month wall calendar displays two months at a time with each month on a separate, repositionable page. Its 12 month date range runs January - December with Julian dates. Its Move-a-Page design lets you choose your two month view: past/current month or current/future month. Daily blocks are ruled for neat handwriting and provide ample note space. Each block measures 3" x 2-3/16". weeks run Sunday - Saturday and Federal holidays are highlighted in Red. Calendar is wirebound with a hanging loop for wall display. 22" x 28-1/2" page size. Calendar displays two months at a time with each month on a separate, repositionable page. 12 month date range runs January - December and Julian dates are included. Choose your two month view: past and current month or current and future month. Daily blocks are ruled for neat handwriting and provide lots of notes space. Each block measures 3" x 2-3/16". weeks run Sunday - Saturday and federal holidays are highlighted in red. Calendar is wirebound with a hanging loop for wall display. 22" x 28-1/2" page size.